I am sharing a fun collection of 6 Antique Sewing Machine Pictures. All are Black and White clipart. We have three beautiful antique sewing machines in fancy cabinets to start our assortment. Two of them have treadles. Next we have two amazing illustrations of old fashioned sewing machines. I would love to have one of these. Finally we have a lovely image of a woman at her sewing machine. I think you could use these to make some fun DIY Wall Decor for a Sewing or Craft Room! What a fun Old Fashioned Sewing Machine Image above! This one was scanned from a rare Antique Printer’s book that dates to around Circa 1880′s. 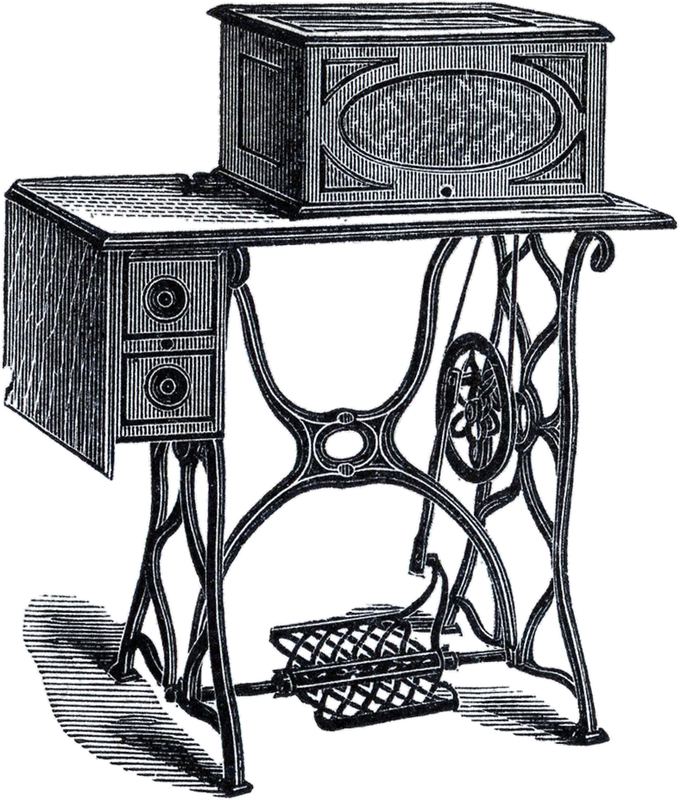 Shown above is a black and white image of an old time Sewing Machine. The Machine has 3 cute built in sewing drawers along the side and a wooden lid to cover it. I love the little floating hand that’s displaying the lid … so quirky! Here is another fun Antique Sewing Machine Picture! This was also scanned from a rare Antique Printer’s book. 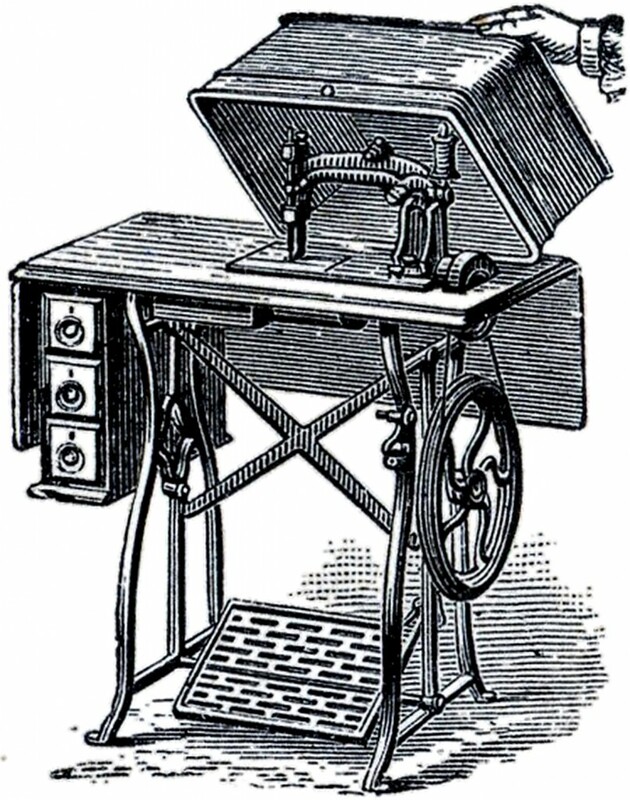 Shown above is a black and white image of an old time Sewing Machine. The Machine has two built in sewing drawers along the side and a wooden cover over top of the machine. Above is an interesting sewing machine from a 1920’s Catalog. Shown here is an Old Fashioned Sewing Machine and a Sewing Table/Cabinet to go with it. The feet are very interesting and large. The treadle is large. This one looks sturdy and made to last. So nifty and decorative! 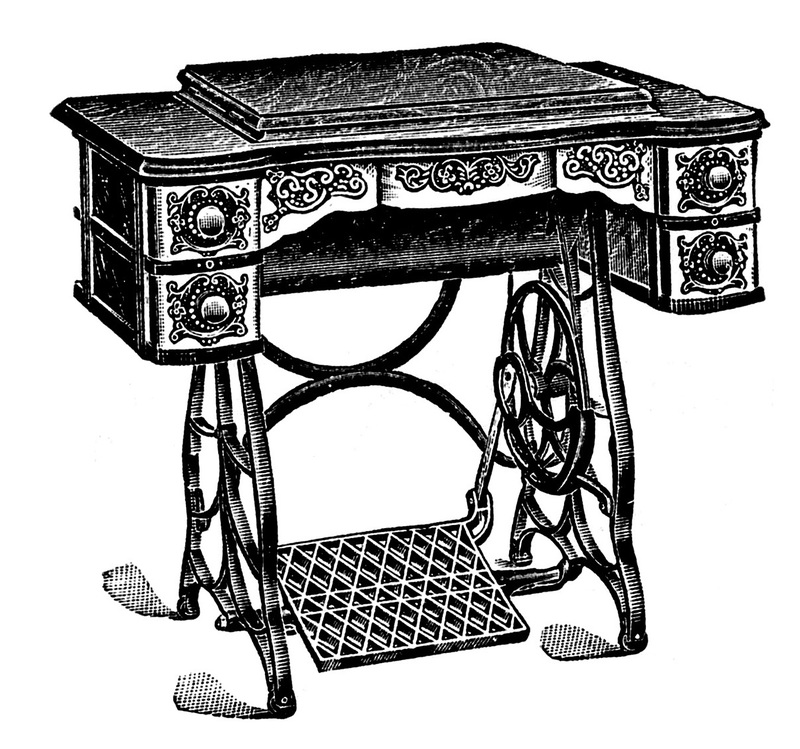 This is a very pretty and classy Antique Sewing Machine graphic from an old Wanamaker’s Dept Store Catalog! 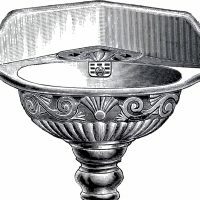 There was no date on the catalog, but I’m guessing it dates around 1880 – 1890. Normally when you see these old Sewing Machines, they are black with gold on them. This one appears to have been light colored, perhaps white or ivory. So lovely! Shown here is an Old Fashioned Sewing Machine from the 1920’s Catalog. Look at the detail shown here of the painted scrollwork and ornament on the machine body and the plate. It has the name “Carolina” across the top. I wonder if that is the maker or the name of the owner. Just beautiful! 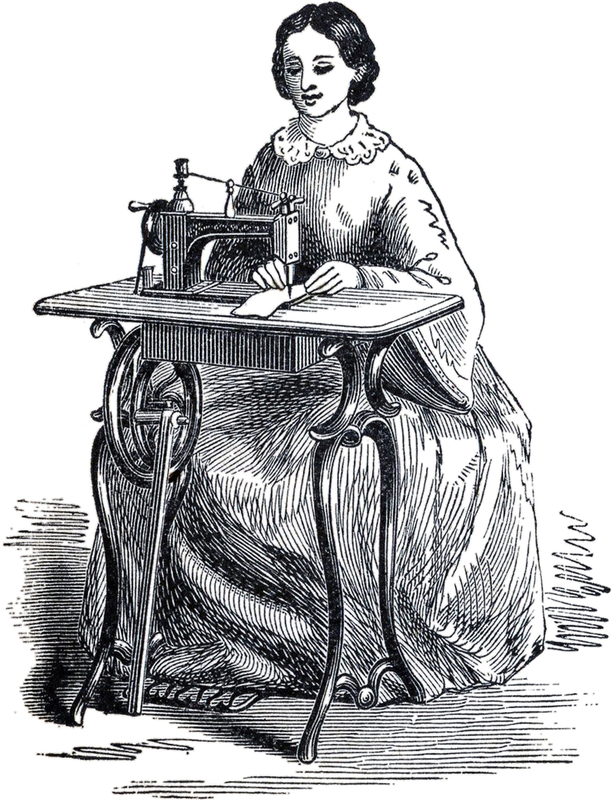 We conclude our Antique Sewing Machine Pictures with an Antique Sewing Machine Lady Image! This one came from the rare Antique Printer’s book–Circa 1880′s. Shown above is a black and white image of a Victorian Lady Sewing a small piece of fabric on an old time Sewing Machine. Her dress is so grand. I love the bell sleeves. I hope you enjoyed this curated collection of 6 Antique Sewing Machine Pictures. You might also like our 12+ Best Vintage Steampunk Images HERE! « 6 Colorful Ruby Jewelry Designs! I love this! 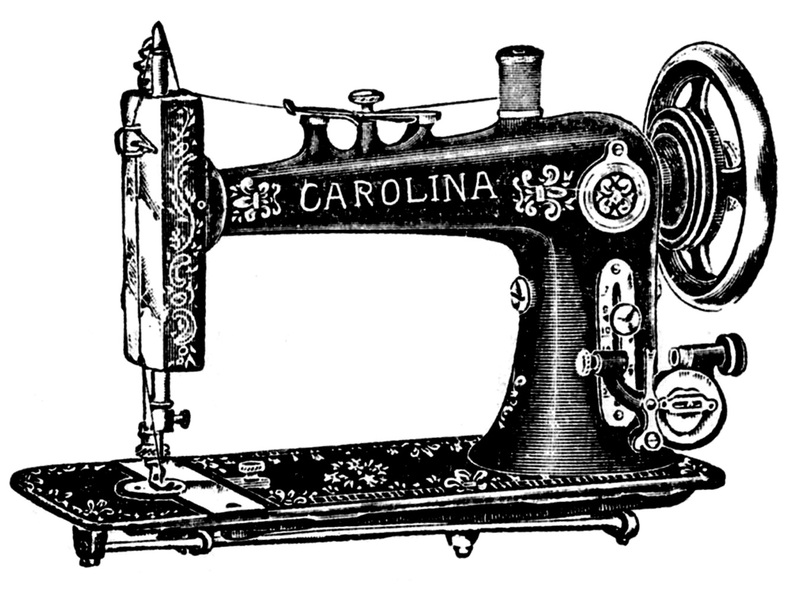 I just bought a mini sewing machine & “carolina” is so close to my name. Not sure what I will use this image for, but will be saving for the future! Awesome, Karen! Thanks a bunch! Love this! Thanks! A great image to use to make something for my sewing sisters, Lou and Sally! Karen, thank you so much for all the lovely images you send our way! They are much appreciated. Loving today’s images – definitely one of my favourites to date. 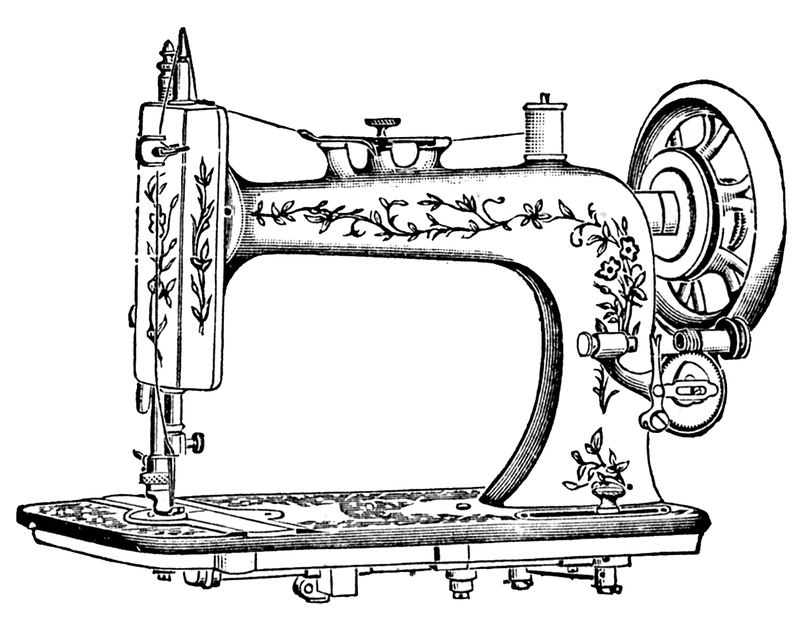 I learned to sew on a machine that looked like this. Once(when I was about 5 years old) I sewed a needle right through my finger and it just stuck there. My older sister heard me yelling, and grabbed the wheel and backed the needle out. It didn’t hurt as bad as it sounds. Overall, I have good memories of the old treadle sewing machine. I sure wasn’t happy when I took HomeEc in high school and had to use an electric sewing machine. It was too fast! Wonderful images……….thank you so much for sharing! Thank u so much for providing all these awesome graphics! I’m also lucky enough to own a sewing machine just like this one so Im thrilled to have these images..I plan on making mini scrapbook about sewing-thanks for all ur hard work!! Thank you so much for your unbelievably beautiful graphics and the work that is behind this wonderful blog!!! I have used some of your images for my blog-header and it looks super cute! Thanks again! Thank you ai made my retirement card. I have one of these. No stickers left and i need a belt but in excellent shape. my question is how much is it worth? Thanks for these lovely images, Karen. I remember my grandmother using an old treadle sewing machine which I later used in my own home. I quite enjoyed using it because I was always scared of how fast my mom’s “modern” machine went. Thanks Sue, I am sure that was both fun and nostalgic 🙂 Thanks for sharing! Did you know those wooden covers for the machines are called coffins? I am trying to build up the bottom of mine to make it high enough to cover my current modern sewing machine. I love them all; thanks so much! Oh yea! So glad you like them Loretta!